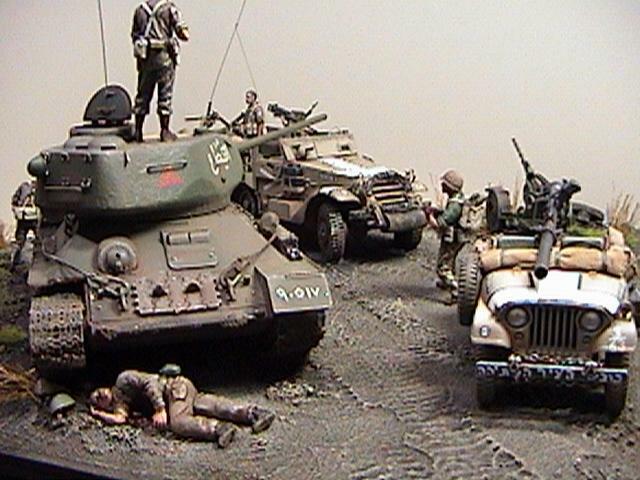 The scene depicts an Israeli armoured infantry carrier (M-3 halftrack), and a recon M-38 A1 jeep. They have just come upon a SyrianT-34/85 which was hit (by Arty or A/C) during a field repair by its crew. They have all been killed. The Israelis who have just come around the bend in the road, are checking out the scene. The jeep, (for those who read Hebrew) is marked as one of the "Attackers of the old city". Obviously brought up to the Golan Heights immediately after the capture of Jerusalem.